Florida’s affordability gap continues to expand with the price of housing growing at a faster rate than incomes. At the same time, the cost to produce housing continues to rise and expiring affordability periods for most funding sources leads to the potential loss of affordable units that will be more difficult to replace. Community land trusts and other shared equity models are tools to preserve investments and create a permanent stock of affordable housing. Below highlights the work of the Florida Community Land Trust Institute (Florida CLT Institute), a program of the Florida Housing Coalition, to promote permanent affordability throughout our state. Not sure what community land trust is? Click below to read our FAQs. A community land trust strategy must be specifically designed to respond to local market conditions, identified housing needs, and available funding. The Florida Community Land Trust Institute (Florida CLT Institute) is a program of the Florida Housing Coalition, which began in January, 2000. The Florida CLT Institute provides training technical assistance, and consulting services to develop an effective strategy for your location. All manner of real property development and financing issues. As interest in community land trusts and other shared equity models grows, the Florida CLT Institute focuses on promoting industry standards and best practices amongst all CLTs in Florida to bring them to scale. Towards this goal, the Florida CLT Institute is working in partnership with Fannie Mae and Freddie Mac to perform program reviews of CLTs and establish a Community Land Trust Certification program. The Florida CLT Institute further advocates for the inclusion of permanent affordability preferences or requirements in local affordable housing programs and regulations, such as requirements for surplus land and inclusionary housing. The Florida Housing Coalition is pleased to partner with Fannie Mae to complete program reviews of community land trusts (CLTs) in Florida in partial satisfaction of Fannie Mae’s eligibility requirements for Community Land Trust Loans. As part of this review, the Florida Community Land Trust Institute also determines if CLTs meet the requirements of the Fannie Mae Selling Guide and Fannie Mae’s Duty to Serve Plan. With the support of BankUnited and Florida Community Bank, the Florida Community Land Trust Institute published its revised and updated Florida CLT Primer in 2015. 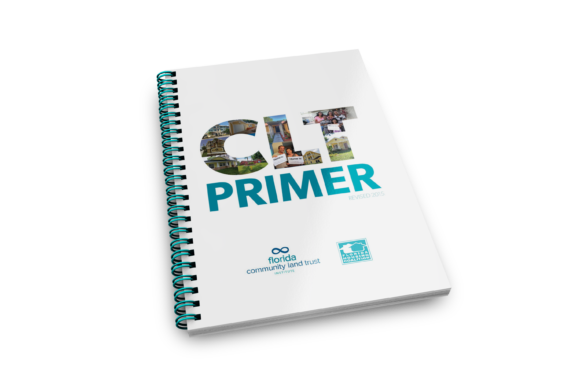 The Primer features the Community Land Trust work of the many successful CLTs throughout Florida. The updated and revised Primer includes: Quick and Important Facts about CLTs; Model Ground Lease; Resale Formula Options; Education for the CLT Homebuyer; Why a Lender would want to Finance a CLT Home; Understanding the Bank Appraisal for CLT properties; Understanding Ad Valorem Taxes for CLT properties; CLT Success Stories; Benefits of Using a CLT for Rental Housing; Benefits of Using a CLT to implement an Inclusionary Policy; How to Include a CLT Strategy in the SHIP LHAP; Using a CLT for Land Bank/Steward of Vacant Land; and How CLTs Save Taxpayer/public monies. The Primer further features the Community Land Trust work of the many successful CLTs throughout Florida. For additional information about the Florida Community Land Trust Institute, call us at 850.878.4219. For more information on the Florida CLT Institute, community land trusts or the Coalition’s technical assistance contact Ashon Nesbitt, Technical Advisor and Research Analyst, at 850.878.4219, or Nesbitt@FLhousing.org.